Working with Lead Exposures in Construction and General Industry Construction Safety Kit addresses the major areas of employee training required by the regulations. Because of the widespread historical use of lead-based paints, as well as other materials containing lead, this program is useful to a number of different groups including building/construction companies, manufacturers, recyclers and many others. 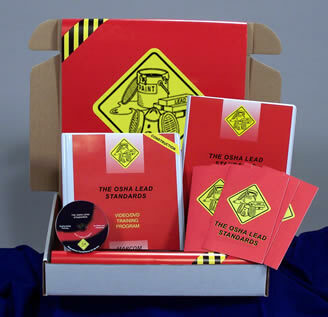 Created specifically for OSHA's Lead Standards (both the General Industrial Standard as well as the Interim Final Rule for Construction), the Regulatory Compliance Kit™ is designed for employees in general industry and construction environments where lead and lead-based materials are found. Materials in the kit include a DVD program, a compliance manual, five motivational posters, and 30 employee booklets. A compliance manual containing a fill-in-the-blank written compliance program, as well as other materials needed to help meet compliance requirements, is included. The posters in the kit remind employees of the hazards that they face when handling various types of materials. The DVD program and employee booklets include information on contents of the standards, measurement concepts to include Permissible Exposure Limits (PEL), Time Weighted Average (TWA), and action levels, exposure assessment and monitoring, methods of compliance, hygiene and housekeeping, medical surveillance, and more. The DVD program in the kit comes with a comprehensive leader's guide, reproducible scheduling & attendance form, employee quiz, training certificate and training log.